Since 2012, the Forward Fund has awarded more than $2.2 million toward programs, grants and initiatives that support early career scientists through research and education. Thanks to you, our donors, hundreds of early career scientists’ careers have been shaped by the Forward Fund. By providing Fellowships, Young Investigator Awards and the one-of-a-kind SITC Sparkathon, SITC is inspiring the next generation, advancing the science and tackling the hurdles facing the field. Here are a few of the many faces of the Forward Fund whose lives and careers were positively impacted by the Forward Fund. We’re proud to share their stories with you so you can join us in celebrating their success. 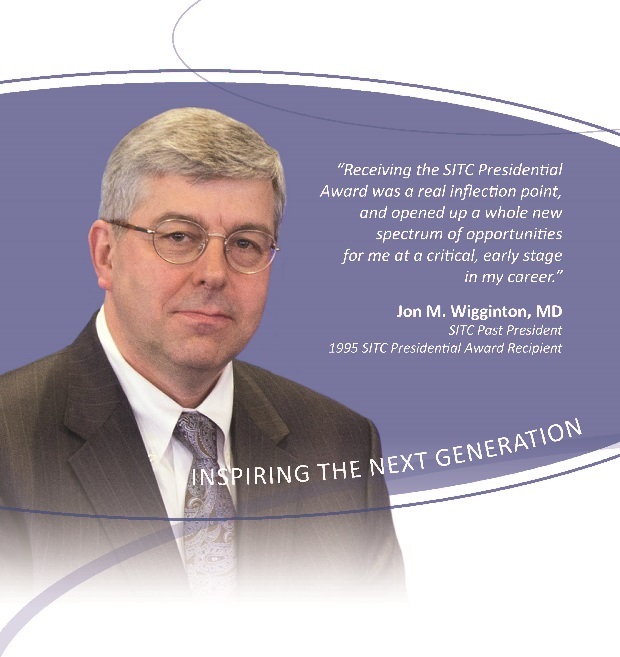 In 1995, Dr. Wigginton submitted an abstract to SITC’s Annual Meeting, and his work was complimented with the prestigious Presidential Award. As a result, he became very involved in serving the society. An active member of numerous society committees, he eventually served as President from 2006-2008. As one of the early champions for establishing a fund to support early career scientists, Dr. Wigginton has enjoyed seeing the number of opportunities grow. He feels a donation helps place potentially transformational resources into the hands of the brightest young minds in the field, and considers a gift to the Forward Fund a wise investment in the future of immunotherapy. 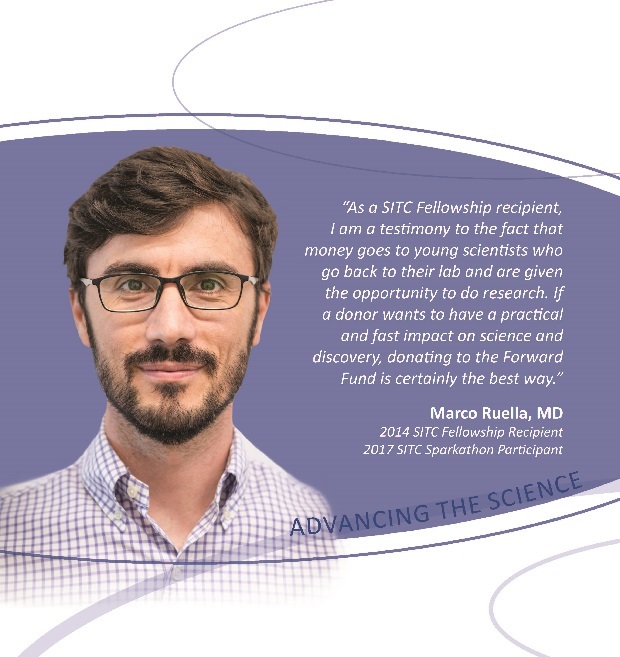 In 2014, Dr. Marco Ruella was more than a year into his postdoctoral research when his mentors suggested that he look to SITC as a source and resource for his cancer immunotherapy work. He applied for and received SITC’s first fellowship award in 2014. Looking back, Dr. Ruella observes it was a turning point in his career. The honor convinced him to forgo returning to Italy to treat patients and rather remain in the United States to pursue his research. As a Fellowship recipient, he feels he is a testament to the success of the Fund. Dr. Stefani Spranger is no stranger to SITC’s Annual Meeting. After previously attending and presenting her abstracts, she received a Presidential Travel Award in 2014. The honor provided well-deserved recognition for her research and exciting new opportunities for collaboration with leaders in the field. She found it to be a pivotal moment in her career, building confidence as she transitioned into a lab of her own. 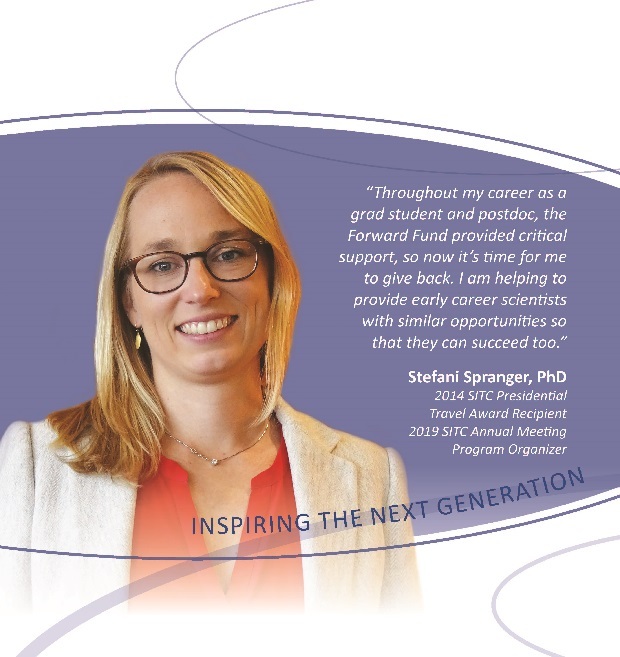 Currently serving as an organizer for SITC’s 2019 Annual Meeting, Dr. Spranger said she hopes to help provide early career scientists with similar opportunities so that they can succeed too. For Dr. Randy Sweis, networking and collaboration are a valuable component of career development, and the Forward Fund has provided an opportunity for him to excel in both areas. Intrigued by the notion of working with a diverse group of scientists, Dr. Sweis applied and was accepted to the SITC 2017 Sparkathon, a program that brings together early career scientists to tackle obstacles in the field. Alexandra Cadena is forging a unique path in cancer immunotherapy. She recently became a team lead for Sparkathon’s TimIOs project, seeking to create a data sharing platform. 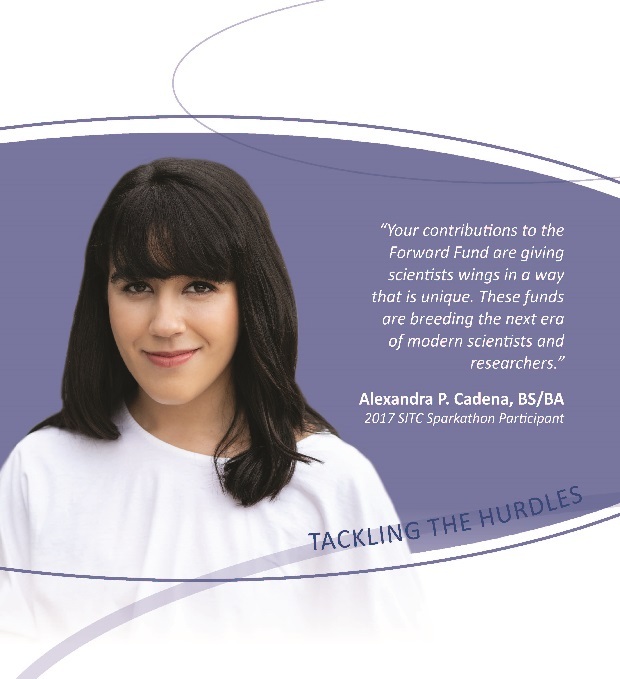 Leveraging her background in science and the liberal arts, Ms. Cadena has sought to bring her unique perspectives to the field. She viewed the Sparkathon as a chance to push scientists to consider the business implications of the work they are seeking to achieve in the laboratory. As a participant, she recognizes that important programs like the Sparkathon need support from donors and believes gifts will make a difference.